Edmund Kealoha Parker (March 19, 1931–December 15, 1990) was an American martial artist, promoter, teacher, and author. Parker was born in Hawaii and raised a member of The Church of Jesus Christ of Latter-day Saints. He began his training in the martial arts at a young age in judo and later boxing. Some time in the 1940s, Ed Parker was first introduced to Kenpo by Frank Chow. Frank Chow introduced Ed Parker to William Chow, with whom Parker trained while serving in the Coast Guard and attending Brigham Young University. In 1953 he was promoted to the rank of black belt. Parker's father enrolled him in Judo classes at the age of twelve. Parker received his Shodan in Judo in 1949 at the age of eighteen. As a young man, Edmund Parker, Sr. came to study at Brigham Young University from his native Hawaii and began to teach the martial arts. By the time he achieved the rank of brown belt, he was already interpreting ideas he had learned from his Chinese-Hawaiian teacher, William Kwai Sun Chow. It was during this period that Parker was significantly influenced by the Japanese and Okinawan interpretations prevalent in Hawaii. Parker's Book Kenpo Karate, published in 1961, shows the many hard linear movements, albeit with modifications, that set his interpretations apart. While most karate instructors were executing one- or two-move techniques, Parker was using linear rapid fire multiple strikes as well as jujutsu-influenced grabs and holds. All of the influences up to that time were reflected in Parker's rigid, linear method of "Kenpo Karate," as it was called. Between writing and publishing, however, he began to be influenced by the Chinese arts, and included this information in his system. He settled in Southern California after leaving the Coast Guard and finishing his education at B.Y.U. Here he found himself surrounded by other martial artists from a wide variety of systems, many of whom were willing to discuss and share their arts with him. Parker made contact with people like Ark Wong, Haumea Leiti, James (Jimmy) W. Woo (a.k.a. Chin Siu Dek), and Lau Bun. These martial artists were known for their skills in arts such as Splashing-Hands, San Soo, Tai Chi, and Hung Gar, and this influence remains visible in both historical material (such as forms that Parker taught for a period within his system) and current principles. Exposed to new Chinese training concepts and history, he wrote a second book, Secrets of Chinese Karate published in 1963. Parker drew comparisons in this and other books between karate (a better known art in the United States at that time) and the Chinese methods he adopted and taught. Parker opened the first commercial karate school in the western United States in Provo Utah in 1954. By 1956, Parker opened his Dojo in Pasadena, California. His first black belt student was Charles Beeder. There is controversy over whether Beeder received the first black belt awarded by Parker. The other black belts in chronological order up to 1962 were: James Ibrao, Rich Montgomery, Rick Flores, Al and Jim Tracy of Tracy Kenpo, Chuck Sullivan, John McSweeney, and Dave Hebler. In 1962, John McSweeney opened a school in Ireland, which prompted Parker to change the name of his organization from the Kenpo Karate Association of America to the International Kenpo Karate Association. Parker was well known for his business creativity. He helped many martial artists to open their dojos. He was also well known in Hollywood where he trained a great many stunt men and celebrities; most notable was Elvis Presley, to whom he awarded a black belt Kenpo. He also left behind a few grand masters who are know around the world to this day such as Frank Trejo who runs a school in California. He also helped Bruce Lee gain national attention by introducing him at his International Karate Championships. He served as Elvis Presley's bodyguard during the singer's final years, did movie stunt-work and acting, and was one of the Kenpo instructors of martial arts action movie actor Jeff Speakman. He is best known to Kenpoists as the founder of American Kenpo and is referred to fondly as the "Father of American Karate". He is formally referred to as Senior Grand Master of American Kenpo. Parker had a minor career as a Hollywood actor and stunt man. His most notable film was Kill the Golden Goose. In this film, he co-stars with Hapkido master Bong Soo Han. His acting work included the (uncredited) role of Mr. Chong in student Blake Edwards' Revenge of the Pink Panther. Edmund K. Parker died in Honolulu of a heart attack on December 15, 1990. His widow Leilani Parker died on June 12, 2006. Of their four surviving children, only his son, Ed Parker Jr., remains active in the system his father created. "I come to you with only Karate, empty hands, I have no weapons, but should I be forced to defend myself, my principles or my honor; should it be a matter of life or death, of right or wrong; then here are my weapons Karate, my empty hands." American Kenpo began with Ed Parker. But it is not a single system as Ed went through five transitions before arriving at what would become the Ed Parker Style of American Kenpo. It might rightfully be said that Ed Parker's new system sprang full grown from the head of Ed Parker, much like Athena sprang fully armored when Prometheus split the head of Zeus with a two man beetle at Lake Tritonis. At least Ed was pleased with this analogy when it was presented to him in 1990. Ed Parker's martial arts training under Professor Chow, his teaching of Kenpo and study of the Chinese systems, his education and his life experience all, like the wisdom of a swallowed Metis, grew in Ed until the past became too confining for his new gift to the world. Thus, in 1965, Ed Parker's new system (his fourth) began to emerge from his genius. But Ed did not reveal this new system completely that early. He was still using the term Chinese Kenpo, which he would soon change to Ed Parker Kenpo. He recognized that his students would not be able to assimilate all of his new knowledge and theories immediately, so he gradually introduced his new concepts and movements over the next several years--"line upon line, precept upon precept... here a little, there a little," that he could "prove" his students "herewith." Ed often spoke in parables and reminded others that even Jesus had said that you cannot put new wine in old bottles. 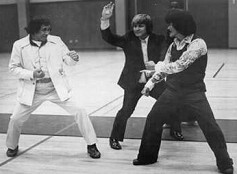 Ed knew that the future of American Kenpo would not be with the his existing students, because they would resist breaking their ties to the past, and most had already gone beyond Kenpo to study kung fu, first under James Wing Woo, and then under Bruce Lee. And as a prophet of the new order, Ed Parker would rightfully foresee that most of his black belts and advanced students would either reject the new system, or forsake it after a few years. Ed felt no great bitterness toward this, because American Kenpo was not created to replace Ed Parker Kenpo. It was created as a way to advance his standard for Kenpo. Ed knew his existing students would not serve two masters. They would not learn a system that was designed to take them where they already were, and most would go on to other systems where they could continue to develop. What Ed eventually created as "American Kenpo" was like, and yet very much unlike, the Kenpo of his former styles. The differences were those of style and theory. His new system would have its critics. And while much of their criticism was valid, no one could deny the genius of the man who was its father. Critics who do not understand Kenpo often ask why Ed Parker did not release videos or films of him personally demonstrating his system. There were several reasons, not the least of which was the fact that Ed would have to slow down so people could see his moves. Ed knew from experience that his students would mimic whatever they saw him do, and one thing Ed was not, was slow. But more importantly, Ed realized that no two people are alike and the new system was to be tailored to the individual. After all, it was the individual who would advance through American Kenpo to where he met the standards Ed Parker wanted. There were also many different ways of doing a movement. Many of his black belts would find that the way Ed taught them was completely different from all the others. To put a technique on film or video would freeze the technique for all time. The move or technique was a framework within which the individual worked. A video would freeze frame the move which would become the way the Master did it; and the only way it should be done. The 5 foot, 98 pound woman would have to emulate the 6 foot, 220 pound Ed Parker. This would go against one of Ed's fundamental principle that he would teach correct principles and let the individual govern himself. The way Ed moved was right for Ed. The way his students should move would not be the same. Thus, he taught his new system differently to each person, and each way was right for the student. Just as Ed realized that there was only one Bruce Lee, or one Mohammed Ali, there would only be one Ed Parker. He did not want his students to mimic him, or to become puppets. He wanted them to become great in their own right. To this end, Ed designed his new system as a method for teaching principles and not just as a way to teach techniques. Rather than teaching 30 techniques and an equal number of variations for each belt as he had done with the Kenpo Karate Association of American and early International Kenpo Karate Association, Ed reduced the number of techniques to 24, eliminated the variations and created what he called "extensions". He also simplified each technique, teaching only the first part of the technique to the beginning student who could now concentrate on the principle of the movement. No longer would a student practice move after move, time after time, like a boxer using the same move time after time to perfect it. He was to learn the "why" of the move and concentrate on, why, as he practiced the move. When the student was prepared for brown belt and black belt he was to learn the extensions and the advanced applications and theories of the moves. Not only was the student to learn the "why" of the move, but by simplifying the techniques, Ed believed his new system could be tailored to the individual who would perfect it according to his own physical size and athletic ability. American Kenpo forms were taught with hipen meaning so only the perspicacious would see what was intended. The system was designed to lead the student through tangled and obscure paths, where the instructor was to point out the meaning of each twist or turn. Then, when it all came together, the student--the Ed Parker black belt--was to emerge from the darkness into the light of new understanding. The black belt would only need to know about 100 applications of his new system, as Ed believed his understanding of the "why" of the movement would replace all of the "techniques" of other Kenpo systems. This was in marked contrast to True Kenpo, where a student was taught hundreds of "techniques" and hundreds of variations--over 400 for first degree black belt alone. This was the system Ed no longer taught. It was the old way, the past, and breaking from this past was the very reason for the existence of the new system of American Kenpo. But it sapened Ed that few students of this new style were able to compete successfully with the old system fighters in tournaments. It would have been even more disappointing for Ed to see the dismal record of not one American Kenpo practitioner being able to stand up in the new ultimate and extreme fighting forms. And where Ed Parker had taken all the Jujitsu moves out of True Kenpo, those in American Kenpo now find they must train in Jujitsu because American Kenpo while great in theory, is greatly lacking in application. Those who understand the "Parker principle" also understand why Ed chose no one to succeed him. Ed didn't intend on dying when he did. After all he wasn't yet 60 years old, and he had not planned for his death. He had formed a living trust to protect his assets while alive, without much concern for when he died. Ed told Will Tracy he was looking for someone to follow in his footsteps, but like Diogenes walking through the streets carrying a lamp in the daytime looking for an honest man, Ed had yet to find one. Ed Parker believed it would take 10-15 years to train a disciple and at the time of his death, there was no one even close to being able to replace him; and so American Kenpo was his legacy to the world. He had taught what he believed to be correct principles, and like Alexander the Great, he would leave succession to those who were best qualified to carry on their own style, but not his. Ed no longer taught in the decade before his premature death. Rather he taught through his writings. He had seen the failure of his new American Kenpo, but he did not believe it was a failure of the system. Rather it was a failure of the black belts of his new system to apply the principles he had established. Some of these black belts left him to found their own organizations where they would teach their versions of his new system, never realizing that they could never teach the principles correctly. They took with them the techniques, but for the most part, they left his "correct principles" behind; and for the most part they have abandoned Ed's system for their own style. In death Ed Parker has become a legend, bigger than life. His black belts first scrambled to fill the void in the system he created by making themselves his successor. But American Kenpo is not just a system. It is the visible expression of Ed Parker's philosophy, a philosophy that holds that correct principles replace style; a philosophy that allows the same move to be taught a myriad of ways with each way being the right way. Ed lamented, some three months before his death that he had awarded black belts, but few Shodan ranks, and none had earned his philosopher's cloak. None had learned to think for himself. Few were innovative. When asked about some of his ideas which seemed absurd, Ed laughed and said he had purposefully taught and written absurdities as a test. But none of his new system students had ever questioned him. He wanted each student to prove or disprove every concept. He wanted them to think for themselves. And he most certainly did not want them to become the puppets they had become. Had his American Kenpo students understood Ed's principles, they would have discovered that the absurd concepts were little more than stumbling blocks put in the way to prove them, and catapults to launch them into thinking for themselves. Ed often lamented that his American Kenpo students knew what to think, but they didn't know how to think, and only a rare few of his True Kenpo students had fully understood Ed Parker Kenpo. For this reason, Ed Parker did not create American Kenpo as a system, but as an idea, an idea that encompassed all of his teachings and styles, from his first students to his last. Some were a part and some were the whole of what he taught, but only those who continued to teach what he taught, the way he taught it either in the beginning or the end are American Kenpo.